Is this cycling’s best photo finish ever? 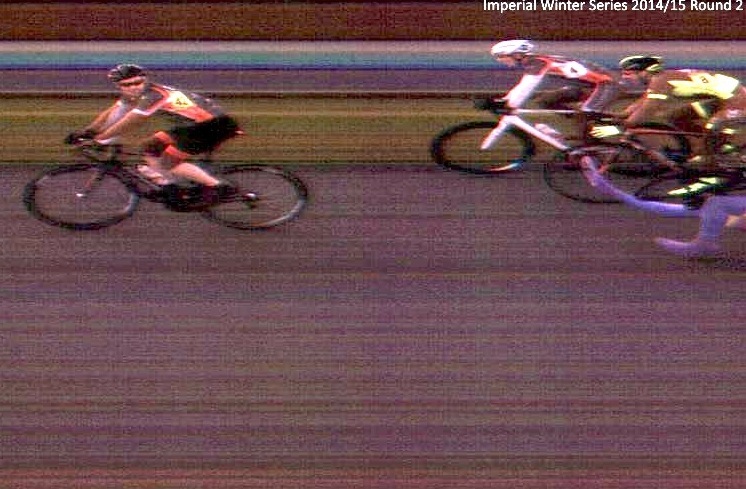 We’ve seen riders hopes dashed by mere millimetres on the finish line, but never anything quite as spectacular as this photo finish taken on the line at the E/1/2/3 race at the Imperial Winter Series at Hillingdon circuit last Saturday. The rider in question, flying backwards entangled in two bikes, was Andy Colsell of High Wycombe CC. Besides bruising and considerable road rash, Colsell came out of the crash relatively unscathed. Fortunately the same was true for the riders involved in the pile-up, and one spectator caught up while watching by the finish. Colsall didn’t actually win. But where did that second bike come from? “There was the first initial crash which you can see on the left of the road,” Colsell added. “That happened and I had quite a nice line coming out from the corner, and I was gaining on people. “That crash happened and I swerved and went round it. I carried on and I was out the saddle, giving it large, and what I saw was there were another two riders went down. Despite a two week layoff and a snapped shifter on his bike, Colsell says the experience has not put him off racing again.